Longmont, CO – Parascript, which automates the interpretation of meaningful, contextual data from image and document-based information, has been selected for the second year running as one of the “100 Companies That Matter in Knowledge Management” in 2017 by KMWorld. The leading information provider for the latest trends and best practices in knowledge, content and document management, KMWorld chooses companies that represent the best in applied innovation dedicated to helping businesses manage their knowledgebase. The KMWorld judges—knowledge management experts, industry and technology analysts and technology users—selected companies based on many criteria and remarked upon the preponderance of artificial intelligence and machine learning advancements today that provide enhanced capabilities for their customers and the marketplace. “The banner of knowledge management spans a wealth of territory to encompass solutions that range in functionality from the tried-and-true to the futuristic. Those designated to this year’s list of KMWorld 100 Companies That Matter in Knowledge Management run the gamut of capabilities, but share such similar characteristics as innovation, ingenuity, usefulness and resourcefulness,” said KMWorld Editor Sandra Haimila. Parascript’s tuned, high-performing SDKs require no front-end configuration and allow organizations to achieve high levels of automation for document classification, data entry and validation with preset accuracy necessary to support demanding applications in finance, operations and other key business processes. 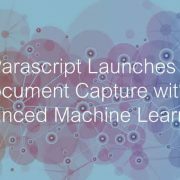 Parascript’s machine learning-based technology locates and interprets information regardless of format and supports a wide range of data types including handwritten data. Parascript delivers solutions that streamline access to customer data with high precision, processing over 100 billion documents annually for financial services, government organizations, and the healthcare industry. “Moreover, the companies on this list create solutions that help their customers turn vast amounts of data into usable knowledge that they can leverage to enhance collaboration, gain insights and achieve their goals,” said Ms. Haimila. KMWorld is the leading publisher, conference organizer, and information provider serving the knowledge management, content management, and document management markets. KMWorld informs more than 21,000 print subscribers about the components and processes — and related success stories — that together offer solutions for improving business performance. With access to many of the most knowledgeable writers and analysts in the industry, KMWorld also offers a number of special publications, including: the KMWorld Best Practices White Papers series — delivering high-value, educational content from industry-leading solutions providers, free from marketing hype and distraction, and the KMWorld Buyer’s Guide — a print and electronic resource that shortens the search for a vendor and helps identify sources for KM tools. Parascript automates the interpretation of meaningful, contextual data from image and document-based information to support transactions, information governance, fraud prevention, and business processes. Parascript Artificial Intelligence (AI) software processes any document with any data from any source with its easy-to-use, image-based analysis, classification, data location, and extraction technology. More than 100 billion documents for financial services, government organizations, and the healthcare and life sciences industry are analyzed annually by Parascript software. Parascript offers its technology both as software products and as software-enabled services to our partners. Our BPO, service provider, OEM and value-added reseller network partners leverage, integrate and distribute Parascript software in the U.S. and across the world. Visit Parascript.